This food slicer is brought to you by Severin and it will make light work of slicing all your meats, deli salamis, crusty breads, vegetables and more, you really will wonder how you managed without a food slicer before you bought it and popped it onto your kitchen work surface. The casing and unit is made from stainless steel with a 190mm (19cm) heavy duty stainless steel blade that has a range of thickness that’s adjustable from 0 – 20mm. The food slicer also comes with a blade guard for keeping your fingers safe from the blade; the unit also has non slip feet to prevent the food slicer slipping during use. Once you have finished using your food slicer you can store away the cable in the cable tidy and pop it into your cupboard ready for it next use but you may find it gets used that much that you leave it out. Food slicers are becoming more and more popular and there is no wonder because they help do all those slicing jobs that you find difficult. 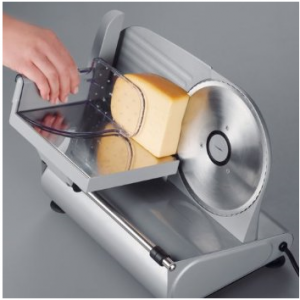 Take for instance slicing fresh bread, this food slicer will make slicing your homemade loaf a breeze. This universal food slicer is very convenient to use and comes apart for easy cleaning, finished in black and silver the food slicer also folds up easily to be stored neatly away. 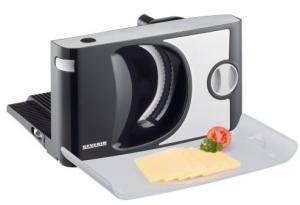 It has a 150w motor and a stainless steel blade which slices your food with ease from 0 – 20mm making it perfect for slicing sandwich fillings because every slice will be the same thickness. One little trick this slicer has that many don’t is an option for the start button to stay down whilst you slice your food making the whole operation a little easier as you can use both of your hands, most food slicers require you to hold a button down whilst you slice your food. The perfect useful Christmas present that will be used time and time again, so why not buy this handy food slicer for your loved one, mum, wife or friend and make this Christmas the year they receive a present that’s useful and will be used time and time again. Copyright © 2009 Food Slicer. All Rights Reserved.